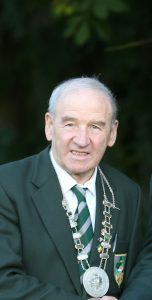 Jimmy Grainger an NPA Director and life member from Kilteel, Naas, Co Kildare has sadly passed away and will be deeply missed by all in the National Ploughing Association. His absolute dedication and whole-hearted contribution to the NPA has spanned several decades. He was even a founder member of the Kildare Ploughing Association in 1952. Jimmy has been heavily involved with Ploughing throughout the years both as a competitor and judge, and he was a former under 21 Champion. He was an exceptional NPA Chairman from 1994 until 1997 and served the association diligently as President from 2008 to 2014 by going above and beyond the call of duty. The NPA would like to pass on their sincere sympathy and condolences to his wife Teresa, sons James & Shane, daughters Emma & Elaine, daughters in law, grandchildren and all of his extended family and friends and thank Jimmy for all he gave to Ploughing throughout the years.